Jonathan Falefasa "Tana" Umaga is a former captain of New Zealand who won 74 caps for his country between 1997 and 2005 scoring 36 tries. Widely regarded as one of the best All Blacks' three-quarters ever, he began his international career on the wing before a switch to the centre in 2000 where he would go on to cement a reputation as one of the best in the world. 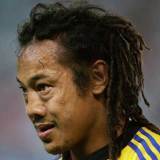 With his trademark dread-locks, he played for the Wellington-based Hurricanes from the inception of Super Rugby in 1996, taking over the captaincy in 2003, until his initial retirement in 2007. Graham Henry named him as All Blacks captain in 2004 and under his leadership the All Blacks won 19 of their 21 games including the clean sweep of the British and Irish Lions. Despite controversy over the first Test tackle in which he was involved with Keven Mealamu and from which Lions skipper Brian O'Driscoll suffered a tour-ending injury, Umaga was hailed as an inspiring leader. He then led the All Blacks to a Tri-nations victory and an end of year Grand Slam tour of Europe, making a surprise retirement after the last international against Scotland. Umaga played for Wellington Lions in the National Provincial Championship and the New Zealand Cup between 1994 and 2007 - racking up 100 appearances. In 2006 he joined French club side Toulon on a short-term contract after his New Zealand Cup commitments with Wellington and earned a reported £250,000 for his seven-match stay. After bowing out of New Zealand rugby in at the end of the 2007 New Zealand Cup competition, Umaga re-joined Toulon as coach. He would later resume his playing career during the 2008-09 Top 14 season at the age of 35. His elder brother, Mike Umaga, who later played as an international for Manu Samoa, preceded him in playing for Petone and Wellington. In December 2011 Umaga was named head coach at ITM Cup side Counties Manukau, after spending the previous season as a player/coach at the club as well as appearing for the Chiefs in Super Rugby. Former and current New Zealand rugby and rugby league players including Steven Luatua, Ruben Wiki and Tana Umaga perform a haka at the Public Memorial for Jonah Lomu.